This topic contains 0 replies, has 6 voices, and was last updated by Quetscher 3 years, 11 months ago. 1. An absolutely tight air chamber possibly made of plastic or lacquered wood. 2. A moisture hole that is big enough to dry out the air chamber properly. 3. The possibility to remove the back easier than to have to unscrew 19 screws (possibly some sort of quick release?). 4. Different mouthpieces for more flexibility and better possibilities to use different playing techniques. 5. A quick release for the grille to change the colour of the tone quickly. 6. The possibility to assign the two sets of reeds (Blowing in and out) to different octaves (for example the reeds for blowing in sound an octave higher or lower than the reeds for blowing out). Now if you may you can tell me some points you would like to have changed. I can’t promise that this will really work, but I’ll do my very best. Quetscher, it would be fantastic if user input was used by the manufacture. I would like to add a option for a built in pick up with a volume control. It’s better if this comes from the factory than an aftermarket addition. Also a user tool set, tools that would be needed to replace or tune a reed, wood or plastic polishing kit. Preferably built into the case. I would pay extra for that option anyday. All your suggestion are pretty much what I would like to see as well. This is a great idea Quetscher! I’d even be happy to meet with them as well, and have an open discussion with other Vibrandoneon/Eolina players. Yes! Constructed in a way that is very easy and quick to remove, again and again, without wear and tear, so it can be dried quickly. Maybe even a hinging grille? 7. Some sort of lever that allows the player to engage the second set of reeds instantaneously, so certain notes, or passages could be doubled an octave higher or lower as part of the performance. This would be fantastic for me. thanks for your your comments, I’ll take everything in account you told me. Oscar, my trader actually does build in melodica-mics made by HDS, but I’ll ask if BB itself could provide a mic system. I’m sure they have already finished the design of the Vibrandoneon and the case, so it might be difficult to get tools within the case, but that I’ll ask that, too. Troy, I didn’t think of a small moisture hole, more something like they had in the old Eolina which was a brass plate at the bottom of about 5x4cm which you could remove, so you could even clean the inside. But I’m pretty sure that they will build the new Vibrandoneon exactly like this. I think that there will be no possibility to double octaves with the new Vibrandoneon, as far as I understood there will only be one set of reeds for blowing and one for sucking. But if I’m mistaken I will certainly ask for such a lever because it was always so inconvenient to change registers. I really like Troys idea of blowing in for a lower octave and then sucking for a octave higher. A hinged grill for a wah-wah effect would be fantastic. Well for now we wait for the big debut. Ha, I can’t take credit for that. It’s Quetscher’s idea!! Picture of the new Vibrandoneon BB All Black Plastic. Can you say Super-Fornza WOW. Now the question is how does it sound and how much. Seems to be a real hybrid between the old models of Eolina and Vibrandoneon (Vibrandoneon mouthpiece plus Eolina hand strap, perhaps this makes it easier to hold). 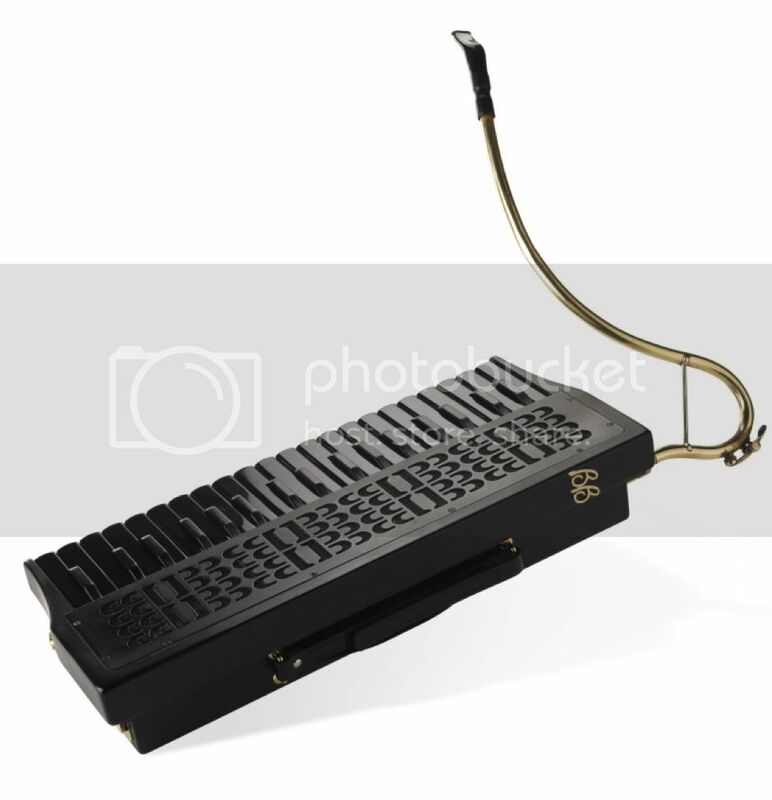 They have an order form on this site where you can choose between different tunings – very good, in my opinion a melodica should be tuned a little higher than 440Hz because depending on the blowing pressure it may sound lower anyway (my Vibrandoneon is tuned 442 and that’s great for playing together with 440Hz instruments). I’m looking forward to trying out that black treasure. That would get some attention on stage. Yes Quetscher, I look forward to hearing it and knowing the cost. – Equipped with some system to hold a high note as a drone without having to keep your pinkie on the key, and thus imitate the sound of the khaen. Come on, I can’t be the only melodica player who tries to imitate the sound of the khaen a lot, can I? – And as a super extra-unrealistic fantasy, some sort of system like what the Blues Box people are building – an easy way to pitch bend without having to have an extremely fine key pressure variation. Of course, such a beast with all those features would probably either be so heavy as to be unplayable, or have to be built of ultra-light high-tech materials and thus the plaything of the 1%, but surely <i>some</i> of those features could be workable. Especially if they’re already building ones with <i>some</i> duplicate rows of buttons. Did you know that some of your ideas have already become reality? For example the Vibrandoneon will be built in a (not 6-but) 4-row version – and perhaps it will be able to give it a Janko layout although then you would only have a range of a little more than 2 1/2 octaves. Victoria (former manufacturer of the Vibrandoneon) seems to have built some Janko instruments a few years ago, but ridiculously with only two rows! The Blues Box bending method seems to be quite interesting although I don’t speak English good enough to understand completely how it works – but the possibility of bending that fast and effectively is fantastic. How about using a clothes pin to hold down a drone note? Beyond that you might a use a small spring clamp of some sort. Industrial equipment catalogs often have scores of various kinds of spring clamps. Could those work on your instruments?